It’s Here, It’s There, It’s EVERYWHERE! Fall 2016 has been an amazing time for our local Arts community! As it turns out, if you can’t find some great art you just aren’t looking hard enough. 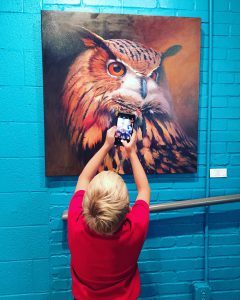 Between the Kaleidoscope Cultural Arts Festival, the Harrisburg Art Walk and various artists setting up at our favorite local businesses such as the Cabarrus Brewery, there is art almost everywhere we look! So, what could be better than an abundance of great art?? A growing number of talented local artists THAT’S WHAT! 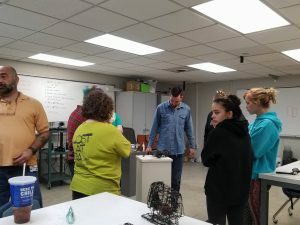 We were surprised to find out that Rowan Cabarrus Community College has a fantastic Visual Arts program that is growing at steady speed. The Visual Arts program is headed up by Fine Art Chair Jenn Selby (who has been described as a rock star in the world of art) and her amazing team of professors. The professors at RCCC, all of which have earned MFAs at prestigious universities across the country, include a wide range of graphic artists, painters, sculptures and various mixed media and video artists. 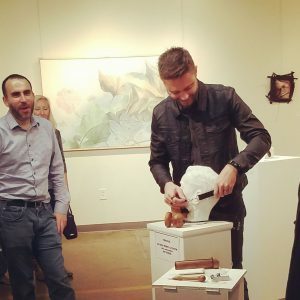 We recently visited Clearwater Artists Studios in Concord to check out some of their work during the Opening Reception of the Inaugural RCCC Faculty Exhibit. The show, which will remain up until October 31st features numerous artworks that you really MUST SEE to believe. One of our favorites was this Sound Synthesizer created by Professor Christian Ryan. We were thrilled to watch him demonstrate it before our very eyes! Ryan took the piece right off of the mannequin and demonstrated the unique sounds that it creates while also explaining how he creates many of his works from trees that he has harvested right in his own back yard! And of course we simply must mention the work of Clearwater resident artist and RCCC instructor, Walter Stanford who was a hit with even the youngest art lovers at the show. 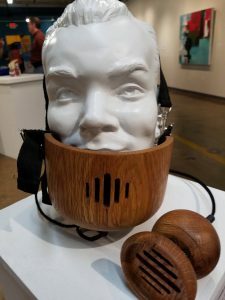 So naturally, after visiting this exhibit we got to thinking… how do these very contemporary young artists incorporate their techniques into their teaching practice? What kinds of art are the students creating? And most importantly, HOW do we find it?? Well, this was a much easier task than we originally thought! 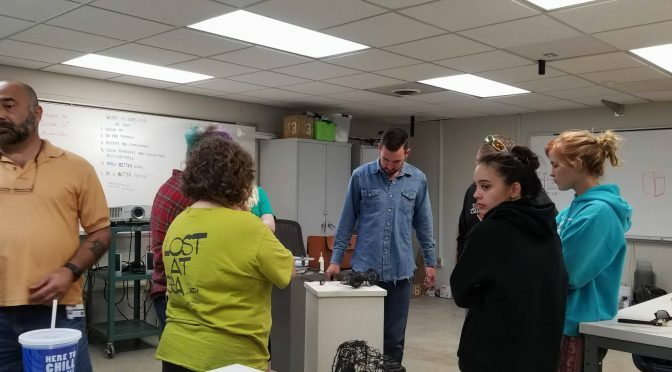 RCCC has art classes on both the North and South campuses and it isn’t entirely uncommon to see a group of students outside working on their next masterpiece. 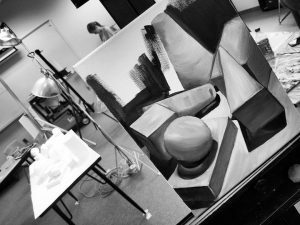 RCCC offers classes in painting, still life drawing and figure drawing with live models, sculpture, ceramics, photography and the list goes on and on! themselves and their peers. They are then encouraged to enter their pieces into 2 student exhibitions hosted by RCCC throughout the year. If you love good art like we do, you will be thrilled to know that the next exhibition is coming up this Friday, October 28th! This show, which is a juried exhibition will feature some of the finest artworks that RCCC has to offer. All pieces have been created by students who are pursuing their Associate in Fine Arts degree and who are dedicated to perfecting their craft. The show will be in a new venue this year in the beautiful Downtown Salisbury. 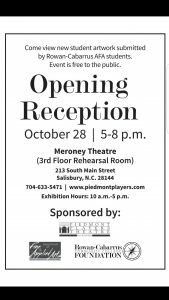 The works will be available for viewing from October 28th-November 5th between 10am and 5pm on the 3rd floor of the historic Meroney Theater located at 213 South Main Street in Salisbury. 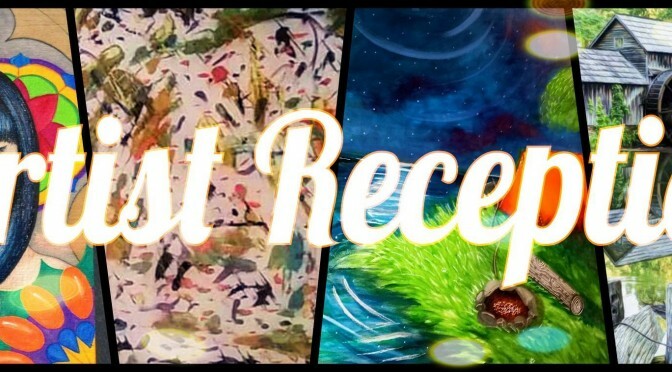 The opening reception will be October 28th from 5-8pm. Many of the artists will be present along with their instructors and refreshments will be served. Please come out and show your support for our arts community by checking out what the youngest among us are creating! We’ll see you there!